1. Capture the reader’s attention with a focal point. Metz Creative design a custom masthead for your newsletter and team it up with eye-catching imagery that draws the reader’s eye to the lead story. 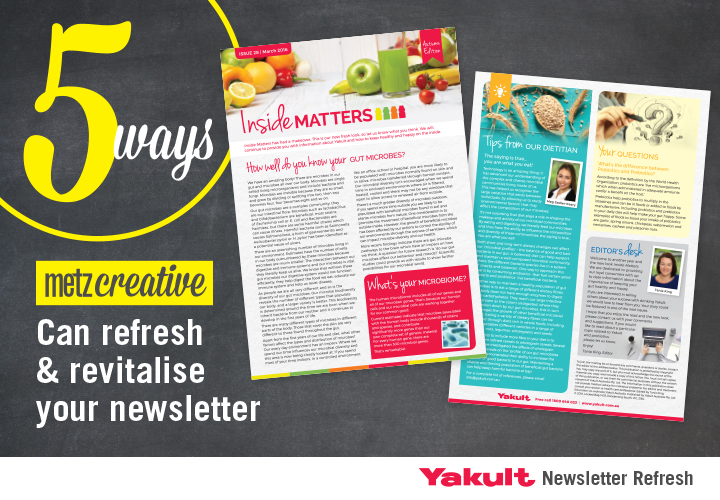 For example, we recently redesigned the Yakult newsletter Inside Matters (featured below) by designing a logo type for the title, selecting bold and colourful imagery to use in the header area to immediately capture the readers attention upon receiving the newsletter. 2. Design your newsletter to fit your brand. Your newsletter campaigns should match your brand’s look and feel. We follow your brand guidelines by using particular company’s colors, font styles and creative images. If your newsletter is consistent with the rest of your company’s branding, then readers will feel more familiar from the start. For example, the Yakult branding is recognised worldwide for the colour red used in the logo and the unique bottle shape of the product packaging, so we have incorporated these design elements into the newsletter design. 3. Keep it simple and organised. Metz Creative polishes the design to create a visually appealing, professional and inviting newsletter that is easy to read. We keep it simple as the eye gets confused if there is too much going on e.g. too many photos or visuals or a busy layout without any white space. This newsletter design employs the use of white space and a clear focus on each article by breaking up the content with pops of colour to add interest. The information is perfectly aligned and carefully placed, with a hierarchy for easy skimming. The use of different type sizes for headings, subheadings and bodycopy allows the reader to understand what’s important and what’s less important. This design is straight to the point with minimal elements and simple structure. A brilliant colour palette with strong, vibrant tones and a unique concept is what makes this newsletter design an attention-grabbing piece. The pairing of the vibrant red feature colour with the creative hero images and colour blocks to separate each article makes for a simple but fresh colour scheme that is sure to stand out in the crowd. In this example of Inside Matters, we use multiple colours to get the reader’s attention fast and makes it very hard not to stop and read the headlines. Creative images, standout calls to action, and strong colour contrast are all effective elements in this design. Visually appealing content is incredibly important if you hope to attract readers. We use creative images in our newsletter designs as they are super effective way to make your articles more interesting, useful, and valuable to your readers. A well-designed newsletter will have a good balance of text and images. When the reader receives the newsletter, they are instantly drawn to images. By adding creative images, this pulls the reader in while enhancing the text at the same time. In this example of Inside Matters, we have teamed up each article with an eye-catching, creative image that directly relates to the content of the article. Overall, you want a newsletter that’s attention grabbing. It should have a clean, organised layout that makes it easy for the reader to digest all of the content. These are 5 ways we can spruce up your newsletter, increase readability and ultimately create a newsletter that your audience looks forward to reading.